It was found that the 'tears' that the statue wept had the same kind of chemical makeup as olive oil treated with perfume. 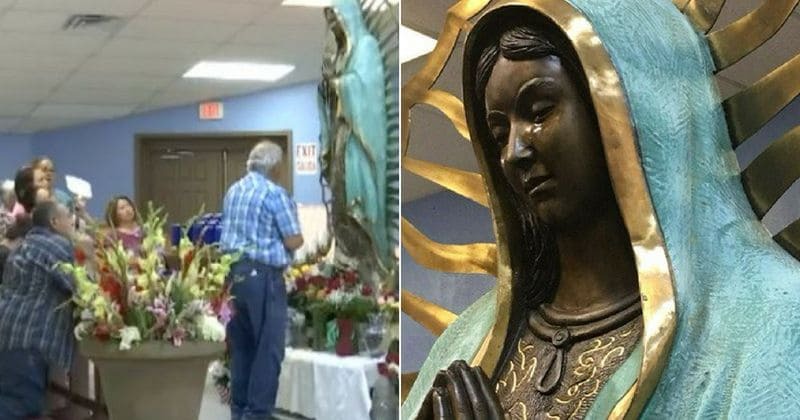 A seven-foot-tall bronze statue of the Virgin Mary has started 'weeping', according to Catholic church leaders in Mexico. The Independent reports that the statute, locally known as Our Lady of Guadalupe, isn't crying human tears, rather, it's olive oil. When investigated further by the Roman Catholic Diocese of Las Cruces, it was found that the 'tears' that the statue wept had the same kind of chemical makeup as olive oil treated with perfume. This substance, when blessed, is known as chrism, an oil used to anoint Catholic parishioners. Church leaders say that the phenomenon drew people from all over for confessions, conversions, and to watch the mother of God cry. The statue first began to 'cry' on May 20, which was Pentecost Sunday, when the parishioners noticed tears streaming down her face. Many members of the church have said that they have never seen anything like this. Judy Ronquillo, the church's business manager, told Washington Post that the statue continued to 'weep' the next day and several more times after that. This may be the message for Christian leaders to stop the bloodshed across the world and they should play the rule for dismantling of mass destruction weapons. The world have new challenges now so we have to end the clash of civilisation era. Though the phenomenon has been praised as a miracle, it has gained the attention of many naysayers. Internet users have a completely different take on the blessed statue. It didn't stop them from bringing in the jokes and puns. And...the statue of Joseph is weeping balsamic vinegar. It’s been a rough week. I’d be worried if she wasn’t weeping olive oil at this point. But is it Virgin Olive Oil? Now if she'd only piss vinegar we could have a decent salad. It's fair to say that the new has attracted its fair share of skeptics.